To create more advanced Batam again, some practitioners and the general rate, the progress of the city as a Satellite City of Batam in Indonesia, needs to be improved in terms of the arrangement or layout of the city. "Because love it if the location and topography of Batam is not utilized, and laid out well," said Ir. Faith Soedradjat, MPM, director of the National Spatial Planning, Ministry of Public Works, when explaining the raod map in the spatial structuring of the Ministry of Public Works media gathering with the theme 'Improving the Competitiveness of Batam' being held in the Swiss-Inn Hotel. Indeed, Faith adds, a lot of interest in Batam which intersect with the spatial layout is a serious need handling by both regional and national governments. Since the era of President Suharto's leadership, the city of Batam's status has been granted privileges with the Authority, which is the construction and industrial development is fully supervised and managed by the Batam Industrial Development Authority, under former president BJ kepemimpina. habiebie. "Actually, since the authority granted in this scorpion island territory, the road map and blue print industry in Batam was already in the set, but the layout and arrangement of space utilization is still not perfect in the set, so everything related to spatial planning, government regions should coordinate central circuitry, "said Faith. Structuring space has become very crucial in the development of industrial cities that rely on trade and movement of an advanced infrastructure and rapidly. To the Ministry of Public Works held a media gathering with the theme layout as increasing the competitiveness of the city of Batam is very marginal. In this city a lot of potential that can be utilized for economic and industrial progress and national development. Present at the Gathering is chairman of KADIN Batam, Nada Faza Soraya, and all the elements Muspida Batam. 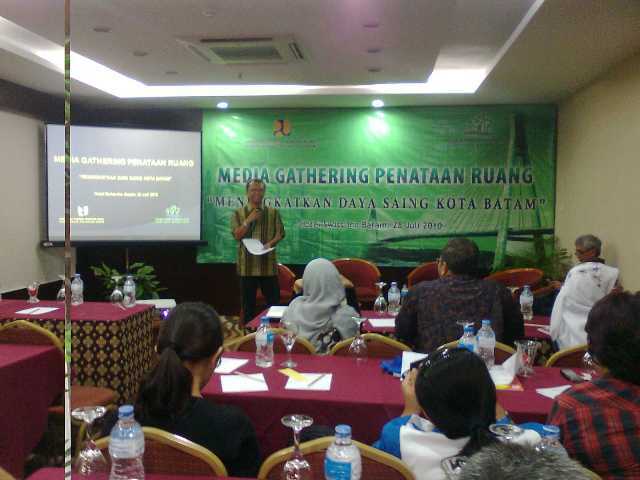 Gatherings are also diikuiti by about 33 participants consisting of government representatives, observers of the development, Public Ministry officials and media workers from various media that exist in Batam. In the discussion session, the tone of Faza Soraya states, in truth must have a Sea province of Riau Islands and Coast guard, or control over traffic maritime. Because the topography of the money supporting owned ooleh Batam, it's time we have one agency or institution that oversees the waters, so far there are 13 agencies that oversee the waters in Indonesia, and this figure does not seem efisian. Also boxed spatial overlap various rules and regulations are not conducive, "said Nada. Batam also should have clear lines for the arrangement of space, so that did not result in spatial management problems encountered in the future. That for this to happen. On that occasion, all participants at the gathering also propose their own views about the spatial arrangement of the city. Who pulled again, the proposal gained from this gathering will also be an advanced referral to the Ministry of Public works and will be followed-up for repair that had been lacking. "A lot of the problems faced by the government, Indonesia is a country with vast and pulaiu waters in the world, certainly not an easy matter to determine where the most appropriate policy to apply the regulations that benefit all parties," concluded Nada.